ps I love her mighty whiskers, she must have been a great hunter and a "nose" for warm places. Als een zilveren kom vol sneeuw. Of een zilverreiger verborgen tegen de heldere maan Ze zijn vergelijkbaar, maar niet identiek.Samengebracht is hun plaats bekend. Wake up and find out you are the eyes of the world, Wake now, discover that you are the song that the morn-in' brings. But this camera really likes (needs) light, I knew when I purchased it it wouldn't "suit" functional greatly for my nightly strolls/sesshins. I hope you realize (pretty sure that you do!) that I'm pulling your leg. The photos are great. People sometimes ask me, "What's the best telescope?" I have to tell them, "The one you USE". You make good use of your camera, as far as I can tell. Hmm: "What's the best meditation method?" Why, the one you USE! (and let's see if we can tweak it somewhat with the teacher's help, and, say, a retreat or two each year). Yes realized dear Brother, and thanks! Nice to catch you here before I go. NOTE!, that Jupiter will be there too, in early morning twilight, and so will Mercury (fainter than Jupiter, lower down, and a bit to the right). So, that's three planets in the morning sky, and one UNDERFOOT, fully four planets, half of the solar system's planets. Clear skies, and I hope you get some photos. Thanks, but for the Dutchy sky (did we plant a flag in space?) only Mercury and Venus in the morning, but only Venus can be seen with the naked eye, telescope is a bit too heavy to drag along. I didn't forget about our large difference in Latitude, but I thought that all you had to do was wait a little longer than I have to in order to allow Mercury and Jupiter to rise a bit higher. But, yes, the catch is that as you "wait", the sky gets brighter with morning twilight, and the sought-after planets may not stand out as in a darker sky. Yet, maybe it can be done (see them all). I hope you have a South-East horizon free of obstructions. I saw all three here this morning at about 06:40. Jupiter and Mercury are visible to the naked eye, no telescope is needed. They are, after all, two of the five planets that were known to the Ancients. Of course, right now, Venus is overwhelmingly bright. I am regularly seeing it here even at Noon, in clear desert sky, under full Sun, of course. But, granted, it's easier to see at 6 AM... . Thanks Joe, I'll see if I get lucky. In the past year, Fuki, I've come to use +1.25 diopter glasses for reading only, as some near-sightedness has set in (or, my arms are shorter). I'm very fortunate that my infinity-vision is still perfect, and even in town I'm seeing to 5th magnitude, and can split Epsilon Lyrae. To see more than six Pleiads, though, I have to go out of town into the more isolated desert (a pleasure). Yes, by all means, take good care of the eyes, Marcel. Give them what they need, and you'll see what you're looking at. Wishes, in this Season of Lights! My Angora cat, at 10 microns wavelength. Cold nose, healthy cat! It was tempting but I won't photoshop you with t-rex arms, last time I already made your head too big. Oh wow that is wonderful! What heat camera do you have? Do it please, if you get a chance. This is a photo-thread! fuki wrote: Oh wow that is wonderful! What heat camera do you have? For three years I've owned and used the "SEEK Thermal 'Reveal' " camera, a stand-alone, all-in-one camera, not relying on a phone. Price has gone up a bit since then, but I think it's still reasonable. There's a camera version with no display at all, but which connects to a cell-phone and uses the phone's display (screen). That model can be had at less cost, since there's less to it, and it's just as capable by all accounts. There may be competitor companies and models by now, too; worth researching if you're in the market for something like one of these. Good luck, and I wish you fun! 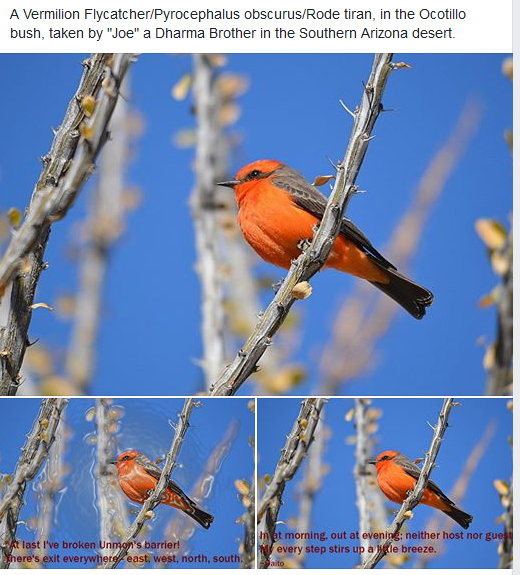 This is a Vermilion Flycatcher, in the Ocotillo bush. Desert sky as background. "At last I've broken Unmon's barrier! There's exit everywhere - east, west, north, south. 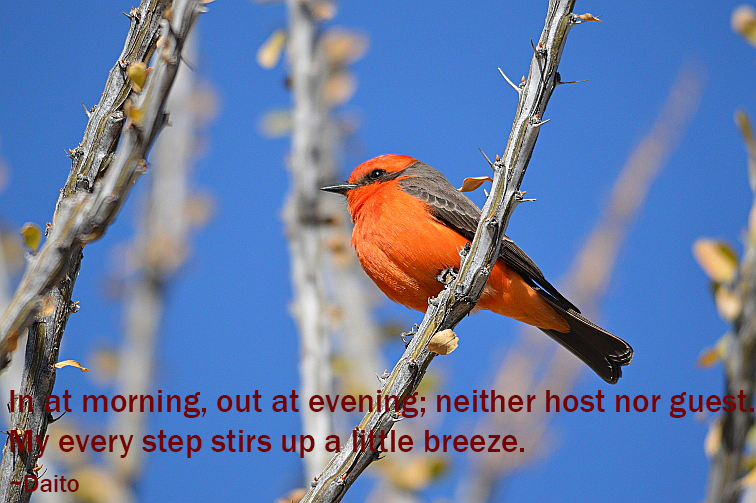 In at morning, out at evening; neither host nor guest. Yes, Fuki, please do. You can credit it with just "desert_woodworker". Or, "Joe" would be fine. And afterwards, will you show us your work? It will be great. Not much work, the "crack" I wanted to photoshop in the sky didn't work as envisioned, so I put the text with filter and slight 16% sharpener to pop out the a bit. Thanks for sharing such beautiful photography though!